ANKARA (Reuters) - Iran's military has successfully test-fired two new domestically made missiles, the defense minister said on Monday according to state television, ahead of talks with world powers to try to reach an agreement on curbing Tehran's nuclear program. Brigadier General Hossein Dehqan said one of them was a long-range ballistic missile with radar-evading capabilities. "The new generation of long-range ground-to-ground ballistic missile with a fragmentation warhead and the laser-guided air-to-surface and surface-to-surface missile dubbed Bina (Insightful) have been successfully test-fired," state television quoted him as saying. "The Bina missile is capable of striking important targets such as bridges, tanks and enemy command centers with great precision." Iran already has long-range surface-to-surface Shahab missiles with a range of about 2,000 km (1,250 miles) that are capable of reaching Israel and U.S. military bases in the Middle East. However, analysts have challenged some of Iran's military assertions, saying it often exaggerates its capabilities. President Hassan Rouhani issued a congratulatory message saying: "Iran's children successfully test-fired a new generation of missiles," the television reported. The decision to carry out the test may be a sign of Iran's political infighting. Rouhani was criticized by a group of hardline lawmakers on Sunday for blocking a planned missile exercise. However, it was not immediately clear whether the test on Monday was the same one. Hardliners, irked by the foreign policy shift since Rouhani was elected in June, have repeatedly criticized the deal. Iran's most powerful authority, Supreme Leader Ayatollah Ali Khamenei, has so far backed the deal. Iran and the six powers will start negotiating a full agreement in Vienna on February 18. 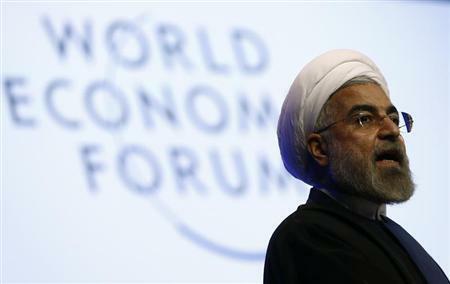 Easing of sanctions, imposed on Iran over its nuclear activities, began in late January. Under Secretary of State for Political Affairs and the lead U.S. negotiator with Iran, Wendy Sherman told a Senate hearing last week that Iran's ballistic missile program would be addressed as part of a comprehensive nuclear deal. Iran's deputy foreign minister and top nuclear negotiator said Tehran had no intention of discussing its ballistic missile program with major powers. "The Islamic Republic of Iran's defensive issues are neither negotiable nor subject to compromise. They are definitely among our red lines in any talks," Abbas Araqchi told state TV on Sunday. "We will not discuss any issue other than the nuclear dossier in the negotiations." Iran rejects Western fears that its nuclear work has military intentions and says it needs nuclear power for electricity generation and medical research. The U.N. nuclear watchdog, the International Atomic Energy Agency (IAEA), on Monday signaled its determination to get to the bottom of suspicions that Iran may have worked on designing an atomic bomb.